The Director of Bhutan Trust Fund for Environmental Conservation (BTFEC) met with officials of World Bank (WB) today at the BTFEC conference hall. 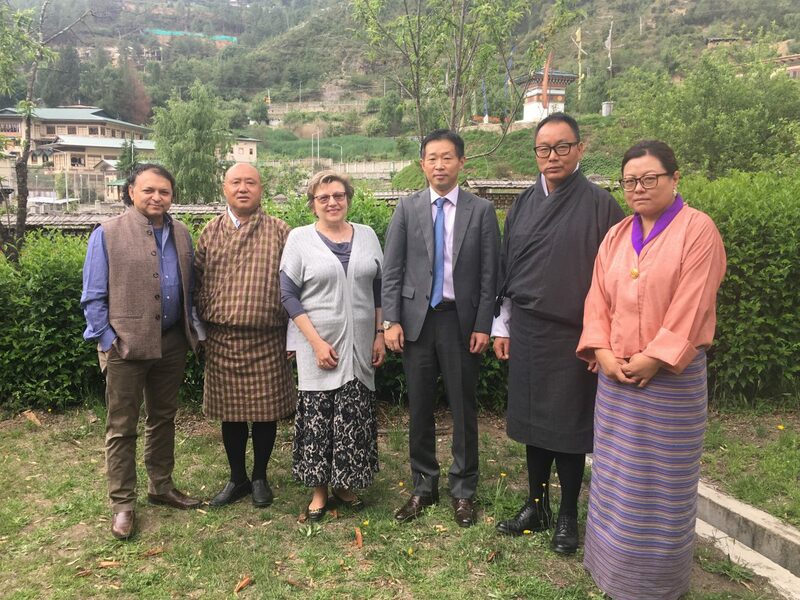 Yochiro Ishihara, the Resident Representative to Bhutan, accompanied the two-member WB mission –Kseniya Lvivsky, and Anupam Joshi. The mission is in the country to review overall progress of the sustainable financing for biodiversity conservation and natural resource management project, including the agreed actions from mid-term review; to review towards achievement of the project results framework and determine if the project is on track to achieve meet the target; and to discuss plans for the completion of the project and the implementation completion report. The Director welcomed the delegation and made a presentation on the BTFEC. He touched upon the Royal Charter, By-laws, different committees and the grant process. The director informed that BTFEC is currently implementing Strategy Plan III (SP III), which was developed in consultation with various stakeholders. One of the key areas he highlighted under the SP III was watershed management. The water sources in Bhutan are drying and it is a huge concern, he said. Talking on the Strategy Plan II, he informed that, when BTFEC was implementing SP II, the government embarked on a programme to intensify its conservation efforts in the high altitude northern areas (HANAS). The government adopted BTFEC grant mechanism, including its policies and processes, to strengthen the prioritisation and management of conservation activities in HANAS. Therefore, the GEF funding for the conservation activities in HANAS was channelled through BTFEC and the latter manages the selection and the monitoring and implementation of the HANAS grant proposals. As of 31 May 2018, BTFEC has funded 14 HANAs sub-projects under GEF-WB project, SFBCNRM, to a tune of Nu188, 180,000. Of these 10 projects are complete and four are under implementation. The project will close by end of this year. WB-GEF played a crucial role in the initial and formation years of BTFEC. Over the years, the BTFEC has improved substantially in terms of its governance; grant making, investment and financial management, and monitoring and evaluation practices. With the additional financing from GEF-World Bank Project, BTFEC’s human resources have also been strengthened, which has enhanced the effectiveness of program management and business operation. With support from WB, BTFEC’s application to Adaptation Fund was fast-tracked and in January 2018, it was accredited as the National Implementing Entity. Similarly, through the GEF-WB project, BTFEC has initiated the semi-annual internal audits of both the HANAs sub-projects and BTFEC funded projects, with the objective of providing timely reports of internal controls, operations and implementation as per the provisions of Royal Charter, GEF-Grant Agreements, Operations Manual, etc. Through the internal audit arrangements, BTFEC’s management and administering compliances has improved. Under the same GEF-WB financing, the Management Board, AMC and TAP members and BTFEC staff has also participated in international conferences and study tours to learn the best practices of conservation management and strategic grant making processes. The Chief Financial officer presented the investment and portfolio management of BTFEC. He informed that BTFEC’s financial endowment is the most important asset, as all operations have to be financed by annual investment income. Investments are guided by an investment policy and specific guidelines adopted by the Board in 2009. The policy confirms that management of the Trust Fund will be undertaken so as to preserve the real value of the endowment (after US inflation), over an extended period of time through a balance between sustainable total return of the endowment and BTFEC spending policies consistent with that return, on a continuing basis. Preservation of capital is commonly the prevailing principle for managing CTF endowments. As of 31 May 2018, the overall endowment’s market value was US$65.245 million, of which US$ 57.523 million was in offshore portfolio and US$ 7.722 million in Bhutan portfolio. The team congratulated BTFEC for being the first Trust Fund ever instituted under GEF and discussed on the area of interest and future partnership.